The Carpenter's Ministry Toolbox: LUTHERAN SCHOOLS: What's your philosophy? A few weeks ago I was interviewed for a position in a K-8 Lutheran school (I'm licensed in H.S. math so my Lutheran school options are limited) and was asked the question I dread. 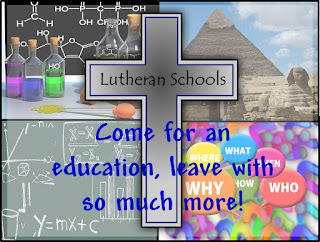 What is the purpose of Lutheran schools? Oh no. (My heart beat faster.) There it is. The standard or expected answer is OUTREACH. Lutheran schools exist to share the Gospel of Jesus. So, when people ask about your school is that what you share first? How is that working for you? Do you have a waiting list? Are people talking about and trying to get into your school because of that? Hmm, from what I've seen, probably not. But why not? Probably because when people are looking for a good school they're looking for a good school. That's their first priority and why I disagree with this purpose. 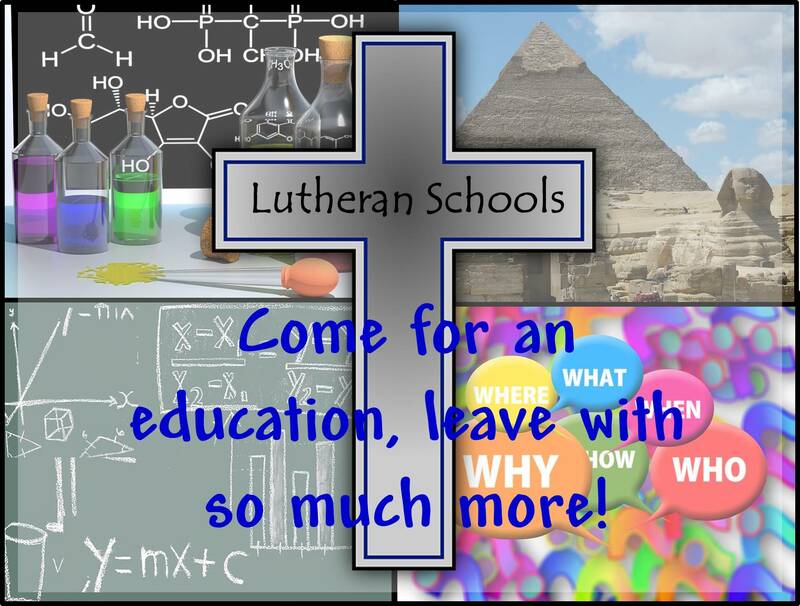 It's not that I think Lutheran schools should be quiet about the gospel, but if a Christ-centered education is a priority then why aren't, at the very least, all Lutheran parents trying to get into Lutheran schools? Here's the situation. Public schools aren't all bad. Some charter schools are pretty good. People choose schools for their excellent academics and EXCELLENT private schools have waiting lists whether they're Christian or not. "But our Lutheran school is excellent!" How do you know? How do people outside the church know? How are you marketing your school? What are you doing to make it excellent? How are you getting that message out? What are you doing to shake things up? Seriously, it's not a slap to God to have the philosophy, "Come for an education, leave with so much more!" But you can't just say it, you have to do it. What is an excellent academic school? One that can show improvement in student achievement. One that can hold its own when compared to the top private schools in your state. One that assesses using the same tools as top private schools in your state. One that has excellent character and behavior standards. One that does not cave to parental pressure without due process. One that has a school board and not a church board. One that has a qualified leader with vision and a plan. One that has ONE grade per classroom. One that has licensed teachers. One that has high standards for its teachers and holds them to a standard. unable to see yourself clearly? too stuck in the past to move into the future? afraid to compare your academics to those of other private schools? so comfortable in who you are that you don't want to do the work to get there? too comfortable with the idea of being a "struggling Lutheran school?" somehow believing that church schools should struggle? somehow believing that excellence in education and outreach are mutually exclusive? COME FOR THE EDUCATION AND LEAVE WITH SO MUCH MORE! Intriguing and challenging post. I like it. Education should be the objective. Introducing and conduits to Jesus becomes the by product of relationships that are formed. No? Can't help it when families come to know Jesus.